The future stars of beach volleyball showcased their talents in Santa Monica last weekend with several South Bay girls earning medals at the West Coast AAU Junior Olympic Games. Manhattan Beach’s Olivia Bakos and Peri Brennan (Laguna Beach) won gold in the 16U division with a thrilling 29-27 victory over a team consisting of girls from Florida and Nevada. Bakos and Brennan made the USA A1 team this year and are training this week with coach and former Olympian Barbra Fontana. They anticipate playing in the High-Performance USA Championships this week in Tulsa, OK where they will face talent from the United States as well as competition from Australia, Canada, Dominican Republic and Puerto Rico. Other locals players named to the A1 team include Kate Reily (Manhattan Beach), Natalie Myszkowski (Manhattan Beach), Ava Gallien (Manhattan Beach) and Savannah Standage (Redondo Beach). 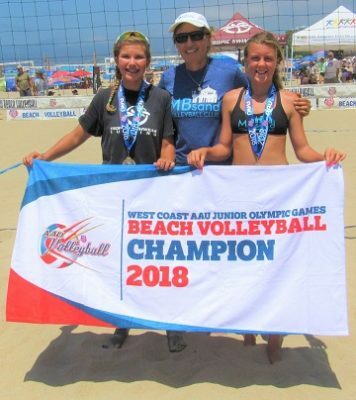 Hermosa Beach’s Erin Inskeep (Hermosa Beach) and her partner, Kate Morley (Manhattan Beach), won the 12U Gold Division at the AAU Junior Olympic Games on Friday. They outscored fellow Californians Malyssa Cawa (Rancho Palos Verdes) and London Wijay (Northridge) 28-17 in the finals. Third-placed medals went to Charlie Fuerbringer (Hermosa Beach) and Julia Waugh (Yorba Linda). Morley agreed with her partner about their toughest opponent and is looking forward to competing with Inskeep in the AVPFirst tournament in Hermosa Beach this weekend. “Erin and I have both worked crazy hard to prepare us as a team for this tournament, so it means a lot to me that we end up taking gold,” Morley stated. In the 15U division, Ava Chew (Encinitas) and Natalie Myszkowski (Manhattan Beach) captured gold with a 29-27 thriller over California’s Jessica Smith (Laguna Niguel) and Camdyn Doucet (New Braunfels, TX). Placing third was the Manhattan Beach duo of Ava Gallien and Leah Kelly. In the 18U division, Manhattan Beach’s Piper Monk-Heidrich and Abby Van Winkle (San Clemente) placed 2nd after losing to champions Sutton MacTavish and Kate Privett of Texas 28-23.